It’s been a strong summer for films with diverse casts and filmmakers, from Wonder Woman becoming the top-grossing film of the summer to now The Big Sick, which features a Pakistani-American lead and several other actors of Asian descent, and is currently wowing audiences left and right to become not just a small box office success but also one of the most acclaimed movies of the year. But like with Wonder Woman, the success of this film doesn’t necessarily boil down to the fact that it’s someone other than another white guy in charge of it; it’s actually because it’s a really great movie, and will fill you with such hope and joy that it’s hard not to fall in love a little with it. The film is based on the real-life courtship of comedian Kumail Nanjiani and his now-wife Emily V. Gordon; both are credited as screenwriters and Nanjiani stars as a fictionalised version of himself, who meets the film version of Emily (Zoe Kazan) after a heckling incident at one of his stand-up shows. They quickly hit it off, but their relationship hits a bum note when Emily learns of his family’s strict insistence on an arranged marriage with another Pakistani woman, as per their tradition, and as a result they just as quickly break up. Not long after, Kumail receives the news that Emily has contracted a mysterious illness, and needs to be placed in a medically-induced coma to help fight it. It is during this time when Emily is comatose that Kumail starts to realise how much he really cares for her, and even starts to bond with her concerned parents (Ray Romano and Holly Hunter). It’s a film that somehow manages to make light of what must have been a difficult time for Nanjiani and all others involved, but never makes a mockery of it; a lot of the humour comes from the initial awkwardness that he experiences on this journey, from the first one-night stand that ends with him driving Emily home as her Uber driver, to the even more embarrassing ice-breaking small-talk with her parents – at one point, Romano’s character “randomly” brings up 9/11 – which, given that Judd Apatow is a producer on this film, gives the actors plenty of natural material to work with. It is a very funny film, something not unlike a few of the earlier Woody Allen comedies like Annie Hall or Manhattan, and Nanjiani uses his comedic gifts to tell a very personal story from the heart both as a writer and as an actor, excelling at both. The relationship he has with Emily is one you instantly root for, since he and Kazan have such great chemistry that when the initial break-up scene happens you’re legitimately sad that they’re apart, and remain so for a large chunk of the film; but while there are times when they can get you choked up, there are others where their adorable awkwardness will have you laughing at the sincerity and relatability of it all. However, the moment Romano and Hunter show up is when the movie really gets fantastic. Nanjiani’s relationship with them in the film is arguably one of its biggest arcs, and also one of its most lovable because both Romano and Hunter are so good in this that you’re rooting for their relationship just as much as you are the central one. There are multiple scenes in this movie that would easily get Hunter a serious shot at a Supporting Actress nomination, she’s that good; and this is easily one of Romano’s best performances in anything, almost good enough to forgive him for doing the last few Ice Age movies (almost). Performances aside, however, their arc in the movie is strong because you instantly identify with these characters, and you completely understand the rational decisions that they make in the film as it’s all to better the care of their ill daughter, so despite their initial coldness towards Nanjiani there is a selflessness on their part for all that they do for their child in this movie, and you’re with them every step of the way. Given that they are based on Emily V. Gordon’s real-life parents, they must be thrilled with this beautiful gift from their daughter that makes them look absolutely wonderful. There are parts of the movie that, while necessary, do tend to stretch the movie right up to its two-hour running time. The whole sub-plot of Nanjiani’s family forcing an arranged marriage on him is a little generic for films with this type of culture (though I have no idea whether it was a real thing that happened or not), and sections of him performing and hanging with fellow comedians can drag ever so slightly, but the fact that they work at all and do raise a laugh or pull a heartstring every now and then helps relieve you of the burden that you’re watching stuff that’s clearly been added for dramatic effect. But these are really only small gripes I have with the movie, which overall I thought was really great; it’s funny, moving, and always has its heart in the right place, and it really makes you even more mad at films like CHiPS, The House and The Time Of Their Lives for failing in all the areas where The Big Sick succeeds, especially that key notion of actually being funny. Those films, and other garbage comedies of the last few years, could really learn a lesson or two from this one. 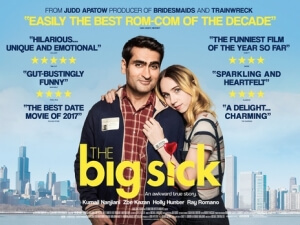 The Big Sick is a charming, funny and moving comedy-drama that handles such a personal event in writer-star Kumail Nanjiani’s life with such grace and honesty that you’ll be astounded by its sincerity and fall in love with it just as you will his and Zoe Kazan’s excellent chemistry, as well as two fantastic supporting turns by Ray Romano and Holly Hunter who seriously deserve some awards attention for their performances here.